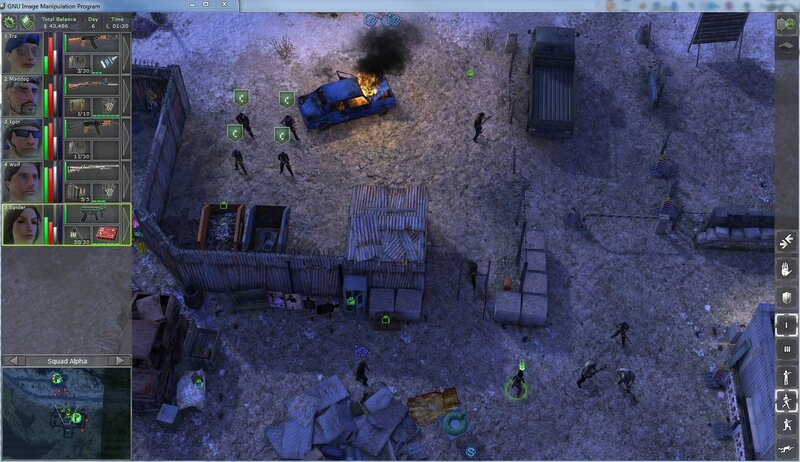 Jagged Alliance: Back In Action is a modern 3D remake of the original 2D isometric Jagged Alliance 2 game. The original game was released in 1999, and I’ve written about it before. In this game, as in the original, you travel to the island nation of Arulco at the behest of its King-in-exile to overthrow his dictatorial and self-serving wife, and retake the country. For money. You build up a team of mercenaries and recruited locals, and slowly retake the country, starving the queen and her forces of money and resources until the country is free again. For money. I think it behooves me to start by talking about this game in the context of the game that it is remaking. Remakes are as tricky as sequels. A lot has changed, including the combat system which is no longer turn-based, but a pausable, real-time, plan-and-go system. The tactical takedown of the guard, that I described at the start, wouldn’t have been possible under the old “your-turn/their-turn” system common to turn-based games like the original JA2. I complained, repeatedly (and probably rather annoyingly) to the empty air that I was having to learn to play the game all over again. And indeed, I was. Almost without exception, I appreciate the tactical richness that the new system brings. Every squad member can be given action orders, these orders can be coordinated with other squad members, so that (regardless of how long previous actions took) two or more actions can be set to take place simultaneously. Additionally, rather than having to micromanage every shot, you can toggle a character into “Guard mode”, letting them overwatch an area in front of them and automatically aim and fire at any naughty people that come into their killing zone. 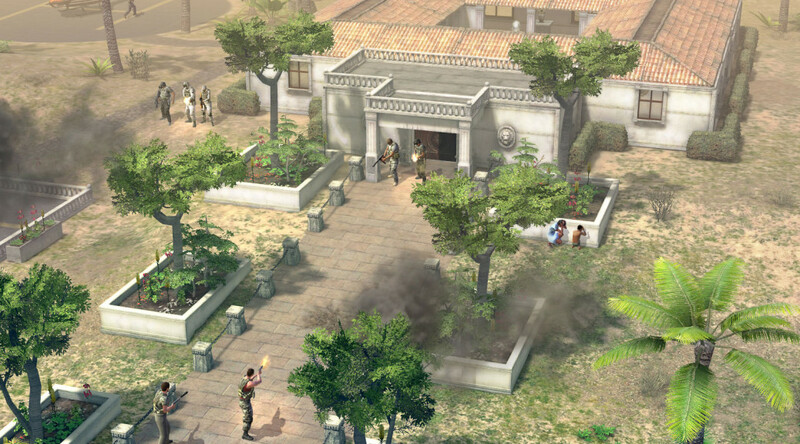 Combined with the uneven terrain that this new 3D edition brings, you can execute all manner of textbook small-unit combat manoeuvres, confounding your enemy with multiple fire-teams and snipers, then melting back into the cover of the terrain, while simultaneously starting a fresh assault from an unexpected direction. There’s a whole lot to like about that. Voice acting has been completely reworked (the original’s was charming but, at times, perilously uneven), and some of the new voice-work is pitch-perfect. These are the changes that I’m unreservedly positive about, though plenty of other things have changed. Some of the original game-systems got cut in the remake, unfortunately. In fact, most of the original game-systems got cut, and – coupled with some of the changes and a hefty slew of bugs – much of the new game is a regrettably uneven mish-mash of superficiality. Something obviously went very wrong during design and development. Maybe the budget or the deadlines ran out. Issue: Stay clear of civilian children. The little rats scurry around your mercenaries, especially during combat, blocking your mercenary from being able to move where you want them to go. Three or four children can hopelessly pin your mercenary down for far, far too long. They also love blocking doorways and narrow spaces. The fact that there are bullets flying everywhere doesn’t seem to bother them too much, except that they will hunker down around your shins and prevent you from taking cover. Issue: Almost all place-names are missing from description texts. Whether it is telling you what country makes a particular firearm or which town a building for a key is in, or which town a strategic bonus is for, there’s almost always an empty space where you’d expect the place-name. It probably has to do with the text-localisation. There’s a black-mark right there. Once you start playing with the strategic map or looking at the descriptions of items, it really stands out. Issue: The game text is riddled with typographical errors. “Tough” is not spelled “though”. It looks like someone ran a spell-checker over the text strings without paying any attention to what the words were supposed to be. Additionally, when you rummage through a container, the container is named “shelves”, “secret compartment” and so forth. Corpses? They’re “closets”. Sloppy. Issue: The manual, loading-screen hints, and in-game text don’t match up with the game. They’re still right for the old JA2 game, but locations and types of mines, the location where shipments are delivered at Drassen Airport (in the new game it is the warehouse, not the hanger as it used to be, and as the text and manuals still insist that it still is), and more just do not match up with the guidance that the game and manuals give you. Issue: Squads are hard to select from the strategic map. If you’ve got an Alpha squad and a Charlie squad, you should be able to select Charlie from the convenient list on the left of the strategic map. Should, but don’t bother. It won’t work. You can only select Alpha. If you want Charlie you’ll need to select it directly from the map itself, which means that any squads that might obscure its icon must be moved away first. 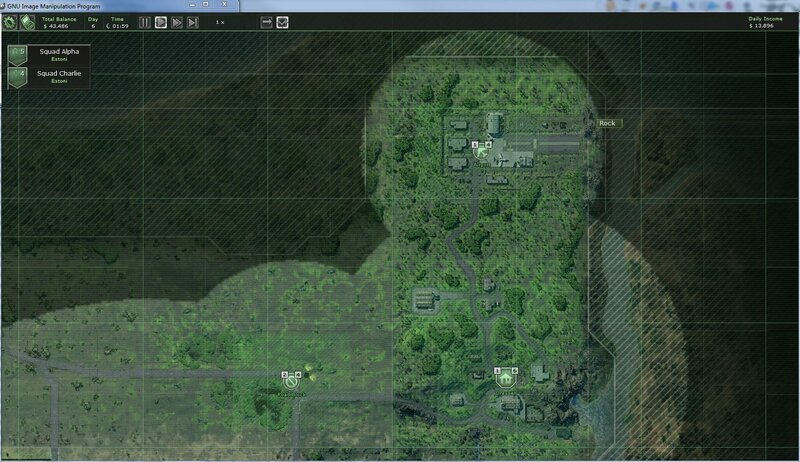 The campaign has been rewritten, NPCs moved around, mission-structures reworked. Pablo no longer tries to steal from shipments, Ira hangs around a bar in Drassen, the mine at Drassen is closed, and there are only three mines now (and they produce diamonds). The in-game materials give the original (now incorrect) number of mines, and still maintains that they produce precious metals. Should have been caught and corrected, but wasn’t. Sadly, there’s no reprise of Kevin Manthei’s distinctive musical stylings. Instead, there’s a functional soundtrack from Dynamedion, which you could easily be forgiven for thinking is the soundtrack from the S.T.A.L.K.E.R game series. Which is fine, though the haunted and lonely tone to the music is quite a difference from Manthei’s firm, martial background. So, things have changed. What’s actually gone? Queen Deidranna and Elliot (her flunky and bearer of bad tidings) and their satisfyingly amusing cutscenes are gone. You can no longer send the evil queen sardonic flowers and gift baskets, for all the business she’s providing you with and watch the results with glee, or see Elliot get increasingly banged-up as the queen takes out her frustrations by slapping him around. Most of the Laptop functions are gone. You can hire from A.I.M. (but not Kline’s M.E.R.C.) and access Bobby Ray’s armaments store, without all of that pretense of looking like a laptop or a Web-browser. You also have the option to look at your balance sheet, or at your email or quest-notes. There are no other services there, even for show. Training your mercenaries is gone. They get skill-points when they level up, and that’s all. With good equipment, a character with a poor marksmanship is nearly as effective as a character with high marksmanship (and the same equipment). Improving your mercenaries’ skills just doesn’t have as much influence on the flow of combat as your choice of equipment and tactics do. And there’s no shortage of merchants in Arulco offering good equipment. Training militia is gone, though the new mechanic where you find someone who is willing to fight for their town and hand them equipment to do it with – that’s actually pretty good. It makes a nice tradeoff between deciding whether to keep a weapon for future sale, or pass up the cash opportunity and use it to boost the manpower/firepower of the militia. Unfortunately, many enemies simply won’t drop their weapons when they die. In fact, all of the various repair, doctor/patient, trainer/student, practice and sleep roles are gone. Let some time pass on the strategic map, and everyone’s rested. A little time there will also cure most minor injuries. Mines, tunnels, the underground is gone. No going into the mines. Skyrider’s helicopter is shot down before the game starts, so no air-travel, and while I cannot yet confirm it, I suspect no vehicle travel of any sort. There are cars, trucks and vehicles of all sorts all over Arulco, many obviously owned by the indigenous military, but they’re nothing more than cover. 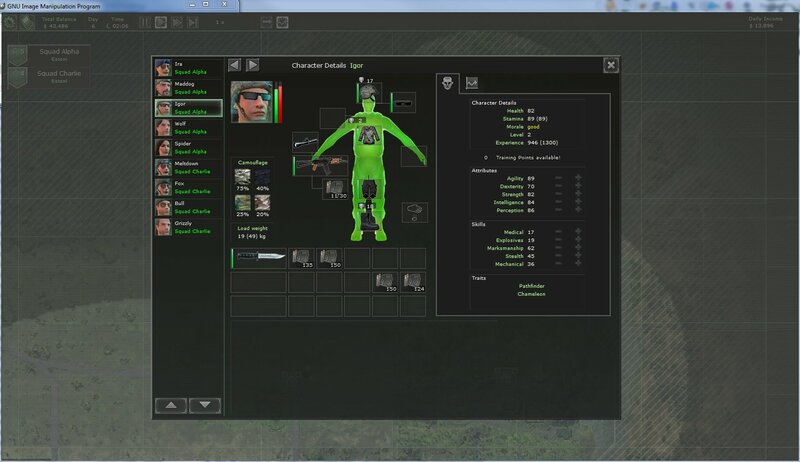 Equipment cannot be traded between characters from the inventory screens, you have to have one character trade gear with another in the tactical maps. Only weapons can be repaired. No tools, or armour or clothing repairs, so once any of that stuff is worn out, you can forget it. This has the side-effect of devaluing publisher Kalypso’s DLC (Downloadable content) packs for the game. Each of them consists of a weapon, an item of clothing and a piece of armour, priced at about US$2. In no time flat, that DLC armour is going to be worn to uselessness (along with the clothing), and have the stopping power of twin-ply toilet-paper; and there’s nothing you can really do about that. So, the benefits you get from two-thirds of each of the DLC packs are probably wasted after the first hour or so of gameplay, making it seem like a bit of a poor deal. You can no longer blow up pretty much anything you like. The walls that you can breach with explosives are all clearly marked with a glowing green marker. 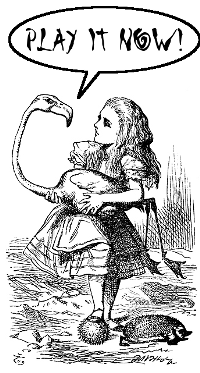 Everything else is obdurate. Different grades of ammunition are gone. The basic calibres are there, but you’ll not see hollow-point or armour-piercing variants. Likewise, no crafting is to be had. Mercenary contracts are gone, as are optional equipment purchasing. You pay a flat fee for a mercenary and they come with the listed equipment. The in-game text still talks about medical insurance payments and so forth, but they’re all gone too. Likewise, the text still insists that contract terms are one day, 7 days, or 14 days and that there are contract-renewals, but they’ve all been cut. You just pay the fee, and the mercenary stays with you for the rest of the game. No more fussing over payroll. Your own character has been cut. In JA2, you would create a character of your own which would participate in the game. That’s gone too. Only hired mercenaries and recruited NPCs are available. There’s no character for ‘you’. Character byplay is gone. One of the most endearing elements of JA2 (aside from the management) was the byplay between characters. They would not only have their own things to say and observations to make, but they would respond to each-other, and to the things that the others said and did. Gone. 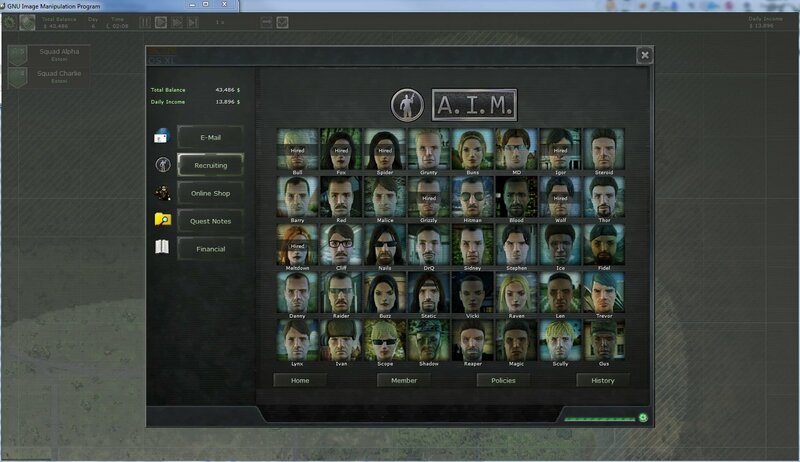 Except for a few morale-based traits, the characters mostly act as if the rest of the squad doesn’t exist, except when making the decision to hire on or not. Most weapon and armour add-ons have been cut. There are a few scopes for larger firearms, and a silencer for the smaller ones. No bipods, underslung grenade-launchers, or flash-hiders. No add-on armour plates for body armour, either. There are none of Arulco’s native bloodcats either that I’ve seen. I’m really not sure if that’s a positive or a negative. The towns of Omerta and Chitzena are simply missing. Fog of war is gone, on the tactical battlefield – at least for you. The bad guys don’t know where your people are unless they can see or hear them, but you always know where every single one of the bad guys is at all times. It doesn’t matter how far away they are or if you have line-of-sight, you always know where they are, can eyeball how they’re armed and know which way they’re facing. This gives you a tremendous tactical advantage. It also kind of makes the extended-ear device a bit pointless, and you may as well just sell them when you find them. I’m not even sure there’s any practical need to have sun-glasses or night-vision gear, other than to differentiate your character portraits a bit. So, yes, if you’re a big fan of the original game, then by now your jaw has probably dropped to the floor, rolled under the fridge and gotten stuck. I mean, if you had to make a list of all the distinguishing things that you really liked about the original Jagged Alliance 2, well, I’ve just told you that pretty much all of those things have been removed. They were things I really liked too. But seriously, what do you really think? You’d think I’d be hating this game, but surprisingly I’m not. Actually, I’m having a great time with it. Mostly the fun I’m having is reduced by the bugs, and also lessened by the sense of all the good game-mechanics that are just plain missing. Executing complex tactical assaults successfully and bringing more of the island nation under your control is extremely satisfying, despite the pervasive sense of overall loss. As its own thing, though, the game is still a fun game – if you can ignore all of the darned bugs, and textual and typographical errors and inconsistencies. Unfortunately, I cannot wholeheartedly recommend this title to you, if you’re a fan of the original game, but I’m still really enjoying Jagged Alliance: Back in Action. I wish I could tell you to “play it now”, but in all conscience I cannot quite do so. Maybe after another major patch or two, or at a discount. For reference, I’ve logged 28 hours with the game now and liberated about 34% of Arulco. So far, while I’m finding it hard to put down despite all of the issues, it really leaves me with a powerful longing to go back and play the original game, instead (with the community mod, of course). It strikes me that some of those faults are nothing to do with the quality of the programming. But if they don’t notice a dumb spell-check, what chance the programming is a mess? Different but still fun IMHO.